You are here: Home » Life Issues & Bioethics » Contraception & Abortion » Question: What Can we Expect From a Second Obama Administration on the Life Issues? 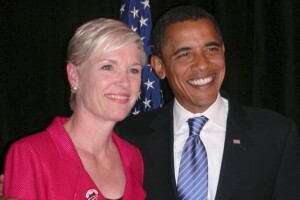 President Barack Obama has compiled quite a record of abortion advocacy and funding since taking office in January 2009. Let’s review it, issue by issue. Supported Abortion Funding: In 2011, the Obama White House formally threatened to veto two pieces of pro-life legislation: the Protect Life Act (H.R. 358), a bill that would repeal the abortion-expanding provisions of the 2010 ObamaCare law; and the No Taxpayer Funding for Abortion Act (H.R. 3), a bill to permanently prohibit any federal program from funding elective abortions. Promoted Abortion Overseas: In 2009, President Obama overturned the “Mexico City policy,” and ordered U.S. funding of private organizations that perform and promote abortion overseas. His Secretary of State, Hillary Clinton, told Congress that the Administration believed that “reproductive health includes access to abortion” and that it would advocate abortion around the world. Eliminated Conscience Protection: In February 2011, the Obama Administration overturned a Bush-era regulation protecting health-care providers from penalties for refusing to participate in abortions. In 2012, the Administration issued a “mandate” that is forcing Catholic and Christian schools, hospitals and other charities to pay for abortion-causing drugs and sterilizations even if it violates their religious and moral convictions. Appointed Abortionistas to the Supreme Court: President Obama appointed abortion advocates Elena Kagan (2010) and Sonia Sotomayor (2009) to the U.S. Supreme Court. Kagan helped President Clinton to block a ban on partial-birth abortions during the Clinton years. Sotomayor had engaged in litigation on behalf of pro-abortion groups, including challenges to parental notification requirements. Promoted Abortion in ObamaCare: In 2010, President Obama pushed through a huge and intrusive health care law that will force health plans to pay for elective abortion, and will lead to large-scale rationing of lifesaving medical treatments. Obama personally worked with pro-abortion members of Congress to prevent effective pro-life language from becoming part of the final law. Funded Planned Parenthood: In 2011, President Obama indicated he would veto the entire federal spending bill—forcing a government shutdown—rather than accept a provision cutting funding to Planned Parenthood, the nation’s largest abortion provider. The Obama Administration later blocked efforts by several states to cut off government funds to Planned Parenthood. Funded Embryo-Killing Research: In March 2009, President Obama issued an executive order to allow federal funding of research that requires the killing of human embryos.